We recommend checking out our discussion threads on the RCF AYRA 5 Active 5" 2-Way Professional Studio AYRA-FIVE, which address similar problems with connecting and setting up Studio Monitors RCF. The user manual for the RCF AYRA 5 Active 5" 2-Way Professional Studio AYRA-FIVE provides necessary instructions for the proper use of the product Pro Audio - Recording - Studio Monitors. The AYRA 5 Active 5" 2-Way Professional Studio Monitor Speaker from RCF provides high-quality audio in a compact design that's ideal for nearfield applications such as home and studio recording, DJ monitoring, multimedia applications, and more. The MDF cabinet has a stylish design with a reflection-free front and a lacquer painted finish to give it a modern look with a retro twist. The speaker has a 5" composite fiberglass woofer and a 1" soft dome tweeter to provide clear, natural audio reproduction with a wide frequency response. The woofer is white to add unique contrast to the black cabinet for a combination of a classic 70's look and modern style. There is a slotted bass port on the front of the cabinet that helps to extend low frequency response while reducing distortion and turbulence. A precise directivity waveguide around the tweeter provides consistent coverage and a wide sweet spot. The speaker has a biamplified Class-AB design that provides 35W to the woofer and 20W to the tweeter to deliver a strong performance with low distortion. The rear panel offers XLR, 1/4", and RCA inputs for wide compatibility with a variety of professional and consumer audio systems and devices. Input sensitivity and HF trim controls let you customize the speaker's performance, and there is also a soft limiter to ensure smooth operation. The speaker also has a selectable 115/230V operating voltage for international use. 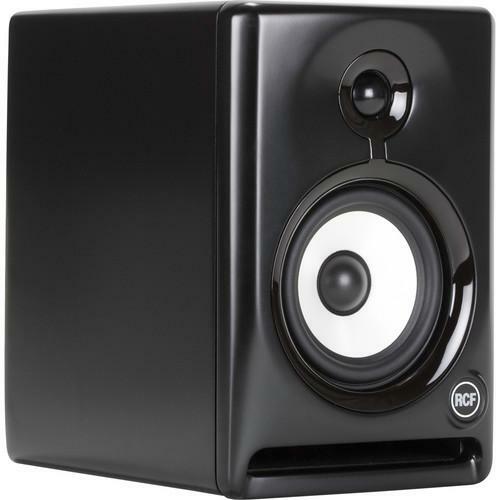 If you own a RCF studio monitors and have a user manual in electronic form, you can upload it to this website using the link on the right side of the screen. Box Dimensions (LxWxH) 15.2 x 13.6 x 10.5"
The user manual for the RCF AYRA 5 Active 5" 2-Way Professional Studio AYRA-FIVE can be downloaded in .pdf format if it did not come with your new studio monitors, although the seller is required to supply one. It is also quite common that customers throw out the user manual with the box, or put the CD away somewhere and then can’t find it. That’s why we and other RCF users keep a unique electronic library for RCF studio monitorss, where you can use our link to download the user manual for the RCF AYRA 5 Active 5" 2-Way Professional Studio AYRA-FIVE. The user manual lists all of the functions of the RCF AYRA 5 Active 5" 2-Way Professional Studio AYRA-FIVE, all the basic and advanced features and tells you how to use the studio monitors. The manual also provides troubleshooting for common problems. Even greater detail is provided by the service manual, which is not typically shipped with the product, but which can often be downloaded from RCF service. If you want to help expand our database, you can upload a link to this website to download a user manual or service manual, ideally in .pdf format. These pages are created by you – users of the RCF AYRA 5 Active 5" 2-Way Professional Studio AYRA-FIVE. User manuals are also available on the RCF website under Pro Audio - Recording - Studio Monitors.